The Fish Passage Inventory Database contains data on over 2,500 stream crossings assessed for fish passage by ADF&G since 2001. 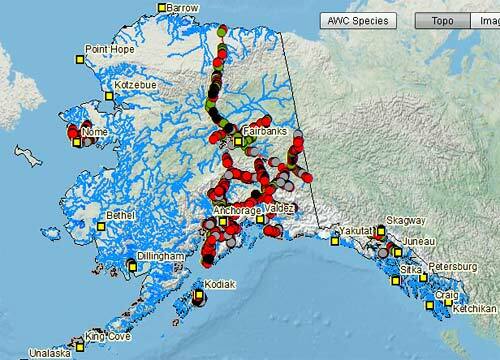 The information is available online to the public via the Fish Resource Monitor interactive mapping application. This information is used by local, municipal, state, and federal transportation managers, local watershed groups, non-governmental organizations, and the general public. If you would like more information concerning the Fish Passage Inventory Database or have questions about the database contents, please contact Gillian O'Doherty, Habitat Biologist, Alaska Department of Fish and Game. 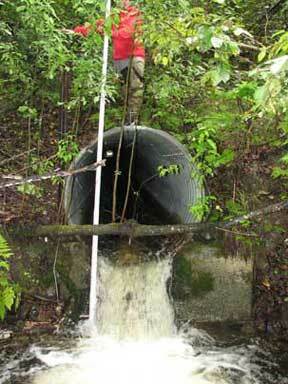 Measuring the outfall height of a perched culvert. The Alaska Department of Fish & Game acknowledges the generous funding support for the statewide Fish Passage Inventory Program from the Alaska Division of the Federal Highway Administration through the Alaska Department of Transportation/Public Facilities, the Alaska Sustainable Salmon Fund and the United States Fish and Wildlife Service. 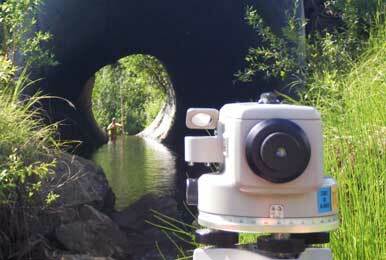 Surveying culverts on the Dalton Highway. The Alaska Department of Fish and Game (ADF&G) makes no guarantee concerning the data's content, accuracy, completeness, or the results obtained from queries or use of the data. ADF&G makes no warranty of fitness for a particular purpose, no representation as to the quality of any data, and assumes no liability for the data represented here. These data do not represent exhaustive inventories, but are compilations of existing knowledge from field biologists that are updated periodically as knowledge improves. These data should be used cautiously because they are not exhaustive, and are subject to change. When conducting projects or planning for fish and wildlife, please consider using additional information gathered from field investigations and consultations with ADF&G or other professional biologists. Unless noted otherwise all reports, documents, images, artwork, photographs and logos within this site are Copyright © 1997–2019 by the Alaska Department Fish & Game or other contributing organizations, all rights reserved. Any person is hereby authorized to view, copy, print, and distribute documents on this site subject to their acceptance of the assertions given in the Interactive Mapping Disclaimer above.